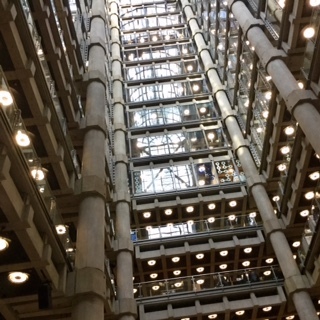 On 21 January 2019, Daphne Berkovi took a group of HGS U3A members to Lloyd’s of London for a tour. Lloyd’s has always had significant involvement in Europe and the USA but now seeks to increase its networks in China, India and other non-traditional markets. In light of Brexit, Lloyd’s has established an office in Brussels to ensure continuity of business arrangements. Lloyd’s is now 330 years old. 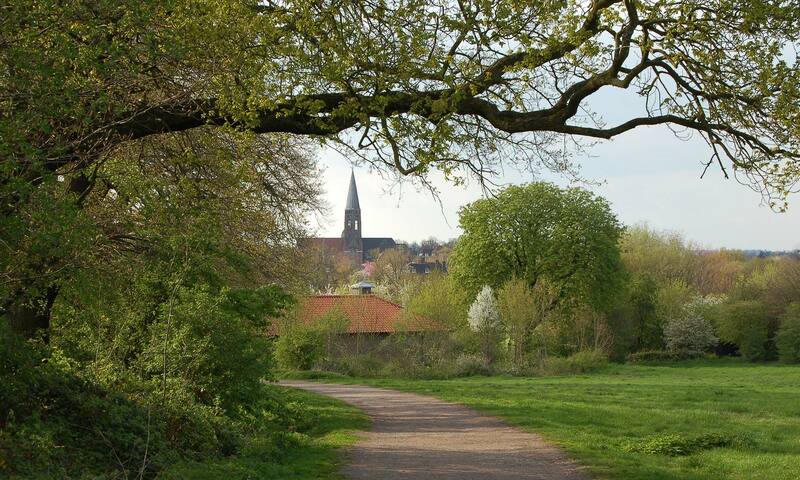 The idea of insurance is believed to have started some 100 years beforehand in the Netherlands. Following the Great Fire of London in 1666, concern grew about the risks being faced particularly by ships. So, in 1688 Edward Lloyd in his coffee shop started to offer mariners the opportunity to insure each other’s ships. They recognised that mariners could share the element of risk arising and that spreading this risk was mutually beneficial. The action of the mariners writing their names under each other lead to the term “underwriting”. For the first 200 years Lloyd’s was only involved in insuring ships and their cargos, and in ship auctions. A huge international intelligence network underpinned the business and Lloyd’s List (now considered to be the oldest newspaper) was established to report on ships’ progress and problems. A Lithuanian Jew called John Julius Angerstein saw the opportunity to expand Lloyd’s market into the Royal Exchange in Cornhill. From 1900 they increased their scope to property including in the USA. A big shock came with San Francisco earthquake and fires in 1906; but the fact that Lloyd’s ensured that all valid claims were paid immediately, in cash, improved Lloyd’s reputation worldwide. The Lloyd’s building at 1 Lime Street stands on the site of a Roman market place. The current building was designed by Richard Rogers and erected between 1978–1986. The “Functional” architectural style is made primarily from concrete and glass with stainless steel cladding, including many round windows to reflect portals in a ship. Lord Rodgers wanted the space to work as market place with uninterrupted views across the floors so brokers can quickly scan the available underwriters. Thus, Rodgers designed an “inside out” building exposing the pipes for utilities, air conditioning and heating and the services such as staircases and lifts all on the exterior so these do not impose on the trading area. The sub-terrain floors also house generator engines to provide independent power supplies. In 2011 it became the youngest Grade 1 listed building in country, so nothing can change without special permission; but consent was granted to change the original frosted glass windows to transparent glass to improve the natural light for staff. Each floor in the building concentrates on different business sectors but the basic approach is the same. 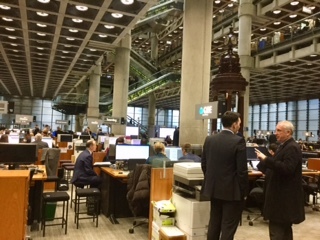 The underwriters are technicians sitting at computer screens in their “box” whilst the brokers rush around the “Room” carrying documents with details of their business to get best quote, traditionally based on face-to-face personal connections. The documentation “slips” are then stamped with an emblem, confirming the lead underwriters who agreed the business and other underwriters then take a share. In the past, wealthy individuals provided capital to provide funds to pay claims. These “names” often earnt good returns, but their unlimited liability meant they could also suffer calamitous personal losses. Since 1980 Lloyd’s intervened to phase out individuals and reformed their arrangements to make sure underwriter’ syndicates manage the risk, and oversee they have enough premiums and capital to pay valid claims. Despite the modernity of the building, history is remembered by the central location of the Loss Book inscribed with major losses and the Lutine Bell that is traditionally rung. The last such occasion was the destruction of the Twin Towers. Also included in the original brief was the wish to incorporate the old library from a previous Lloyd’s building on the site; and this is now the main meeting room, which oozes history both from its historical style and from the paintings of past chairmen hanging around its walls. Whilst the original brief made provisions for these historical factors, plans were fairly advanced before the council chamber was incorporated. The Adams Room was rebuilt brick by brick into the space and, being two storeys high, resulted in truncating the headroom of the floor above. 5000 staff work in the building. Facilities include a wellbeing centre and restaurant. Lloyd’s continues to review and reform its practices in line with current thinking. For example, until the 1970s no women could join the staff and there remains a predominantly white, male, upper-class profile; but there is increased awareness of the need to improve diversification amongst its staff. Similar adaptations have replaced the red-clothed “waiters” that passed messages in the previous 1956 Lloyd’s building. Lloyd’s will no doubt find ways to adapt with modern technology communications systems.